What is an Air Cast? An air cast is a medical device that encases a healing body part in a cushioned casing, reducing pain and promoting healing. Typically, it consists of two basic components, an air-filled splint that is surrounded by a hardened exterior shell. 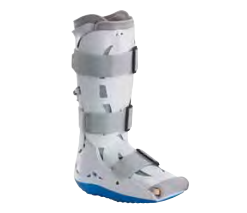 Aircast walking braces have a lightweight, durable semi-rigid shell that help support the limb while providing full-shell protection. Lining the shell are overlapping aircells providing intermittent pneumatic compression for edema reduction and callus formation. These aircells can be custom inflated for a “total contact” fit. Additional features of certain models include SoftStrike technology which absorbs and dissipates shock, while the light weight and lab-tested rocker sole combine to encourage a natural gait and a continuation of everyday activities. All models come with hand bulb. 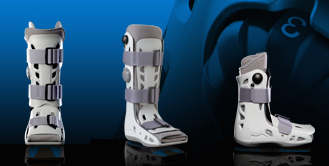 A special AirCast is available for those with Diabetes.